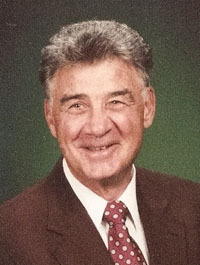 Ray was inducted into the St. Louis Soccer Hall of Fame in 1996. Ray started playing Soccer in the late 1930’s at St. Ambrose and played for 20 years until 1957 when an injury shortened his playing career. Bob Guelker invited him to start refereeing in 1958 for the CYC which lasted 20 years. In 1959, he began to referee High School and College Soccer, and is currently refereeing in and around the St. Louis Metropolitan area. He received a recognition from NISOA (National Intercollegiate Soccer Officials Association) for outstanding contributions in the field of Intercollegiate Soccer in 1988. In the summer of 1967 he was called to referee games in NASL (North American Soccer League) and games there from 1967 until 1977, a total of ten years in the professional ranks. One of his greatest thrills was officiating games in which the New York Cosmos star player, Pele, played. Additionally, Ray has given many Soccer clinics to the South County area parishes and helped coach young Soccer teams at his parish, Most Precious Blood. Ray’s total refereeing experience accounts for 48 years. Ray was awarded the Gold Boot in 2004.